The kidnappers of four residents of Lekki Gardens in Isheri, have demanded N1.2 billion ransom for their release. It was gathered that they made contacts with family members of the victims, suspected to be held hostage in the creeks, yesterday. 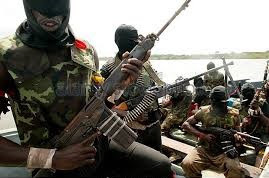 According to Vanguard, the victims, Mr. Kennedy Ucheagwu, Dr. Omololu, Bello and Mr. Esang, said to be landlords at Oshorun Heritage Estate, had gone for an aerobic section on Saturday, when eight masked gunmen in military camouflage intercepted them, shooting sporadically. While others managed to escape, same could not be said for the victims, as they were whisked away in boats through the waterways. “I got a call very early yesterday, where the unknown caller informed that he was one of the kidnappers that took our people away on Saturday. Ali also appealed to relations of the victims to support police with useful information that would enhance the rescue operation, adding that he was working with the Commissioners of Police in Lagos and Ogun states and other stakeholders to ensure the rescue of the victims and to sustain the fight against crimes within the commands.